Today I add a new category to the blog – author interviews! 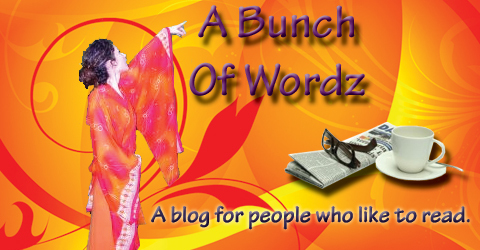 First, thanks so much for taking the time to share your experiences with me and the “A Bunch of Wordz” readers. 1. You obviously had a lot of options available to you being a Harvard Law School graduate. What made you decide you wanted to get published, and do you make your income exclusively from writing now? Well, yes, a Harvard Law Degree opens many doors. Mainly to law offices. Or government positions, teaching, or even corporate finance. As for why I wanted to write, law is a literate and learned profession, but as a practical matter it involves spending thousands of hours working on numbingly dull material. I did anticipate problems with legal practice even in law school, but thought that when I was older and wiser, I would see it all differently. Never happened. I reached a point at which I just wanted to create one thing that was fun, original, and not ponderously long. As for the financial question, some of my books have sold surprisingly well. Haikus for Jews has earned more than many novels and non-fiction books. Especially on a per syllable basis. As financial strategies go, though, it might have made more sense to explore the exciting opportunities in ostrich farming or telemarketing. But I don’t practice law and feel fortunate to have escaped the golden handcuffs. 2. When you decided to publish your first book, did you get an agent first or did you approach publishing houses directly? What was that experience like? Everyone told me to get an agent, which I did. The experience with my first couple of agents wasn’t great. Lesson 1: Never work with a literary agent whose “home office” is in her living room, near an exercise bicycle. Lesson 2: While friends may be able to introduce you to famous, successful literary agents, such agents are not always good with small, quirky books. When an agent who doesn’t know the market for your book takes it on as a favor, it’s not that big a favor. 3. What were the steps you took to find an agent? To find a suitable agent, I looked at the “Acknowledgments” in lots of small, humorous books. Writers often thank their agents there, and I jotted down the names and looked them up. I gradually assembled a list of agents who had sold offbeat humor to respectable publishers. Some of them actually did get back to me when I sent them samples. I don’t know if this works as well for other genres. 4. Have you run into any roadblocks getting your work published since your books fill such a unique niche? Yes, of course. One agent looked at my sample pages of Haikus for Jews and said, “Yeah, I could get about two cents for this.” She was so derisive that it took a while before I mentioned the idea again it to anyone. 5. Is there anything in your publishing career you would have done differently if you had known then what you know now? Clearly I lost some really good years as a law student and lawyer, including many long all-nighters in the office that could have been devoted to more worthwhile activities, such as sleeping. And I would have had more time to improve as a writer. Then again, publishing involves a lot of rejection and disappointment. Had I gone straight into some form of writing, each time I had a setback I might have thought, “If only I had gone to law school.” Now I don’t have that problem. 6. What advice would you give to authors on how to go about getting their first manuscript seen and accepted? Look for agents and editors with a track record for handling similar work. Try to extract constructive suggestions from people who reject your submissions. And if your first manuscript is rejected everywhere, take a break and start something new. You can always revive the first project later. You may sheepishly realize in a year or two that the people who rejected your first attempt spared you great public embarrassment. 7. What advice would you give to authors looking to transition from a corporate career to a career as a writer? Don’t quit your day job? If you have children, put them up for adoption? First of all, set achievable goals. When I gave notice, I remember a lawyer confiding to me that he had always wanted to quit and write the Great American Novel. Not very realistic, coming from a guy who worked 14 hours a day on airplane leasing documents. Pick writing projects you can actually do. Give yourself plenty of time to unlearn all the bad habits you’ve acquired in the corporate world. And if someone advises you, “Go into haiku, that’s where the money is,” stop listening to that person. 8. What is the craziest, weirdest, or funniest thing that has happened to you as a result of your writing career? Hmm… Nothing too crazy. A lot of my books have been copied or, really, plagiarized on the web or in e-mails that people forward all over the place. As a result, one person I met insisted I hadn’t written Haikus for Jews. She said, “You didn’t write that. It’s from the Internet.” She seemed unacquainted with the “book” concept and treated me like some sort of fraud.